cultural boundaries is the Arabian horse. “Orientalism” was a term first used several centuries ago to describe scholarship and art by “Westerners”—shorthand for Europeans and North Americans—who sought to depict largely Islamic cultures of North Africa and Asia. Some 40 years ago, it came under criticism for cultural bias. 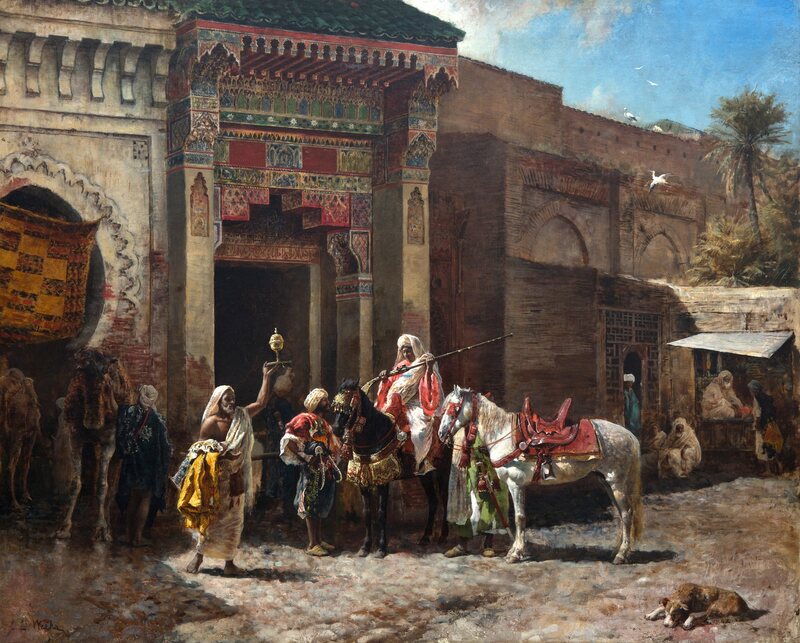 Despite these changes in attitudes, one subject in Orientalist art has remained universally admired: the region’s horses. 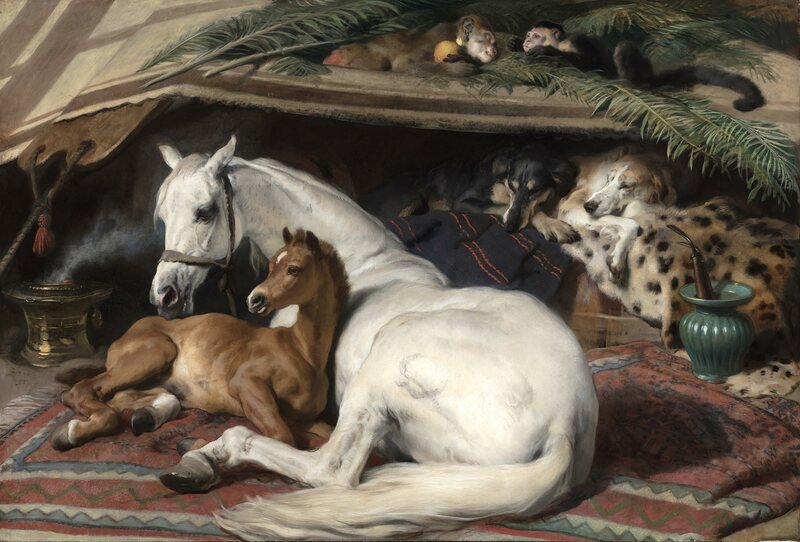 The 19th-century European and American artists who specialized in scenes of North Africa, the Levant and the Arabian Peninsula were as enamored of the equines of those lands as were the inhabitants. The paintings from certain easels were more convincing than from others. “Some artists would portray any horse they painted to match the physique of the Arabian horse,” says Rania Elsayed, an equine veterinary authority and photographer at University of Exeter in England. Clients did not tend to question bioscience when buying an image: Horse plus Arab rider plus “Oriental” setting were often enough, even for connoisseurs who might, regarding other subjects, be more discriminating. The institution that has done the most to keep this niche of East-West fraternalism alive is London’s Mathaf Gallery. Since the 1970s it has stuck with the field that was for decades tainted for its colonialist origins. 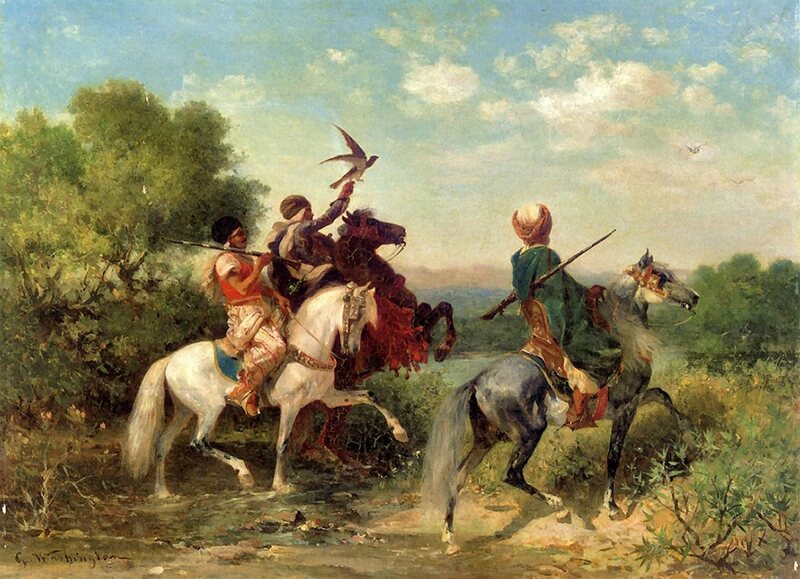 Delacroix became the pioneer Orientalist artist, relying on his memories of a single visit to North Africa in 1832. His love of animals is clear from the many paintings and drawings made before then, and his Romantic respect for the peoples he visited comes through in his diary: “The Moroccans are closer to nature in a thousand ways. 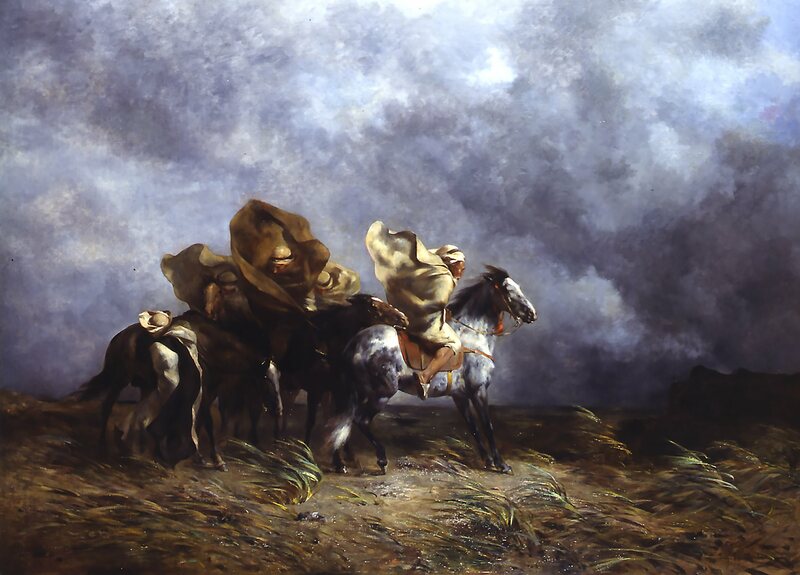 Fromentin’s painting of the hot, dust-filled desert wind known as the simum might not have been so moving if camels had been the centerpiece. 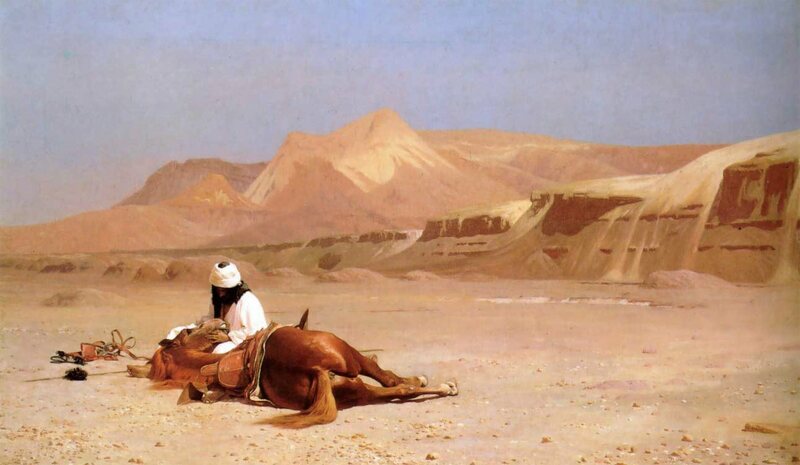 As it is, the painting shows the mutual vulnerabilities of both man and horse, which confront as one the desert storm Fromentin whipped up so vividly. A tender view of an Arabian mare and her foal, the painting limits Arab elements mostly to a rug and the painting’s title. The non-equine occupants include dogs and monkeys. 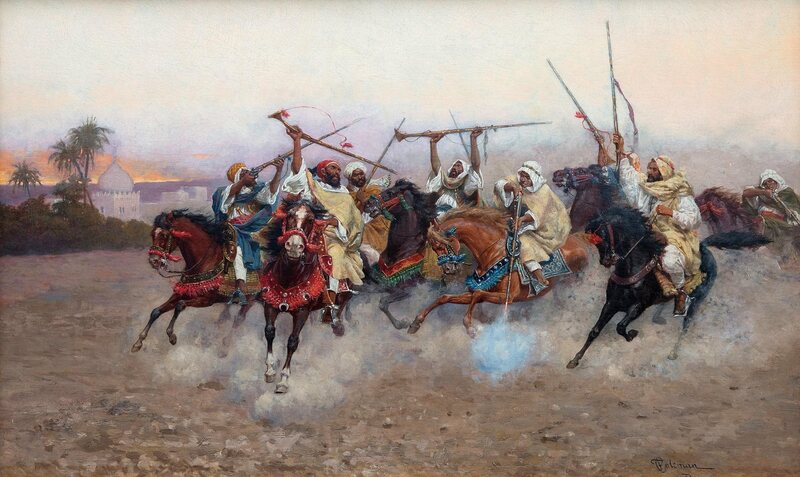 Absent are blood, battle and tension that were so often associated with Arabian breeds by many 19th-century artists. The bond between rider and horse is unequivocal. 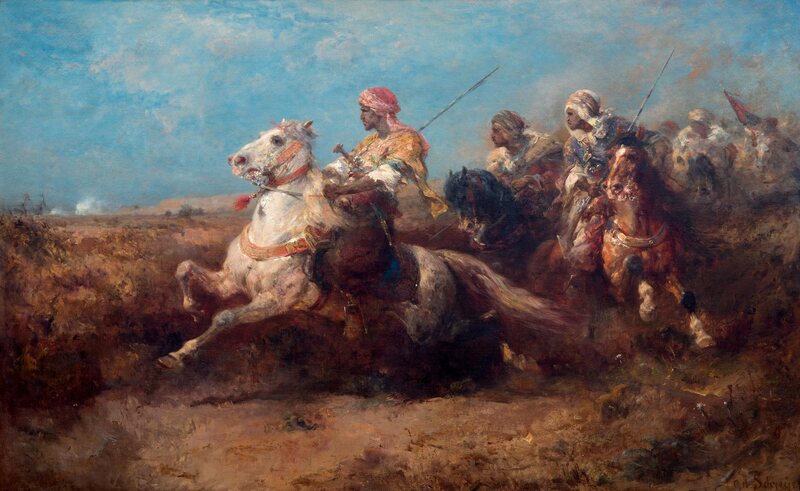 Gérôme also understood the accoutrements of equestrianism, and although later he painted a view of an Arab rider buying a bridle and other accessories with his signature precision, here such elements are secondary to this tear-eliciting tour de force. The softness of Schreyer’s brushwork does not diminish the intensity of his moment. The group’s commander heightens the sense of drama: He is fully loaded with weaponry although the rifles seem to have rather slender barrels, especially when contrasted with the powerful physiques of the leading horse and rider. Warfare was a supreme test for a horse, and both Europeans and Arabs praised Arabian breeds for their speed and agility in battle. “These tribesmen are celebrating,” she says, “which is probably why the horses wear elaborate saddle cloths and embroidered chest bands. The horses are not scared of the musket shots.” The abandon with which the riders are firing their weapons provides an exaggerated spectacle. 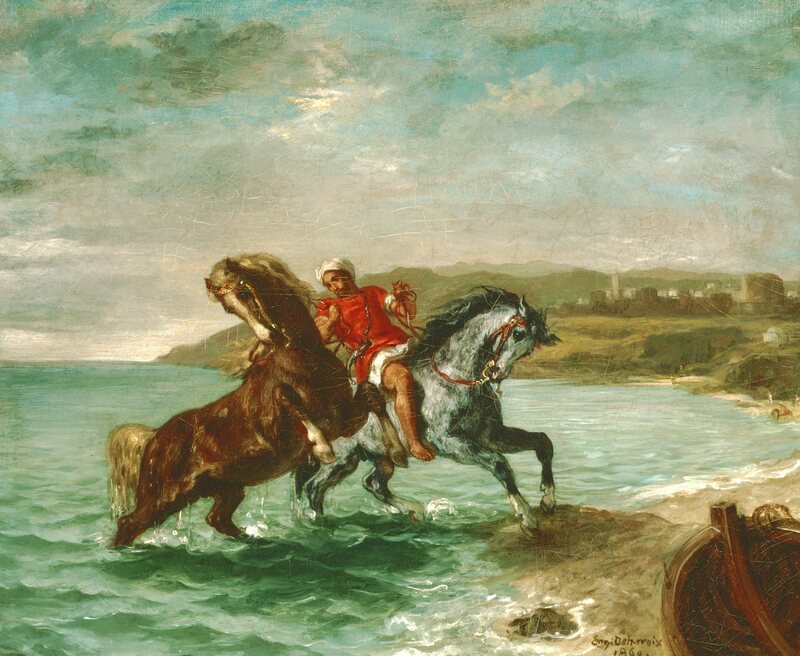 The horse in this painting is radiant, even by Weeks’s standards. The brocades and gilt trappings suggest a more important occasion than merely meeting a gun seller outside the gate of a bazaar. He brought a theatrical quality to a composition that in real life would not likely have included such a princely figure making a roadside purchase. is a former head curator of the Islamic Arts Museum Malaysia and is now its associate curator, based once again in his London hometown. He is the co-curator of an exhibition on East-West encounters to be held at the Brit-ish Museum in October 2019. Just east of downtown Abu Dhabi, traditional Arab urban principles are informing high-tech construction in Masdar City, one of the world’s most complex experiments in urban sustainability. Stretching 80 Roman miles across northern England, Hadrian’s Wall took 8,000 men to maintain and defend, among them some 500 Syrian archers. With them came merchants, too, including one Barates, who married a local woman. When she died, he memorialized her on stone, leaving a glimpse of daily life along Hadrian’s Wall.